You'll be £25.00 closer to your next £10.00 credit when you purchase Amiens 1918. What's this? Order within the next 2 hours, 55 minutes to get your order processed the next working day! Gregory Blaxland has written a superb account of 1918, the final year of the war when the balance of advantage between the combatants changed so dramatically in a matter of weeks that summer. As the realities of the changing nature of warfare by late 1917 made the retention of static lines, no matter how sophisticated, no longer a long term viable option for the defence; and with Russia knocked out of the war, the Germans under Hindenburg and Ludendorff determined on a bold series of major offensives, the first of which was aimed at the British Fifth Army with the objective of seizing Amiens, a crucial rail head and the city that marked the boundary between the BEF and the French. Capture this and the Germans had a good chance of separating the key allied powers. Despite almost destroying Fifth Army and advancing within ten miles of Amiens, the Germans failed in their objective; they turned to a number of other hard thrusts along the line but were foiled on each occasions. The book largely concentrates on the British and Dominion troops of the BEF. The first half is taken up with the attack on Amiens (and, to a lesser extent, on Arras). In the second half of the book the author provides a cohesive account of the British response in retaking the initiative from the Germans, though not failing to give allied nations their due. Besides giving a full narrative account, he also provides a useful critical commentary of the performance of armies and generals. This is a welcome reprint of an accessible account of the crucial year of the war, when on the Western Front the conflict broke free of its entrenched deadlock. Despite the extraordinary achievements of the BEF in 1918, they still remain remarkably little known and even less appreciated. Gregory Blaxland has written a superb account of 1918, the final year of the war when the balance of advantage between the combatants changed so dramatically in a matter of weeks that summer... This is a welcome reprint of an accessible account of the crucial year of the war, when on the Western Front the conflict broke free of its entrenched deadlock. Despite the extraordinary achievements of the BEF in 1918, they still remain remarkably little known and even less appreciated. 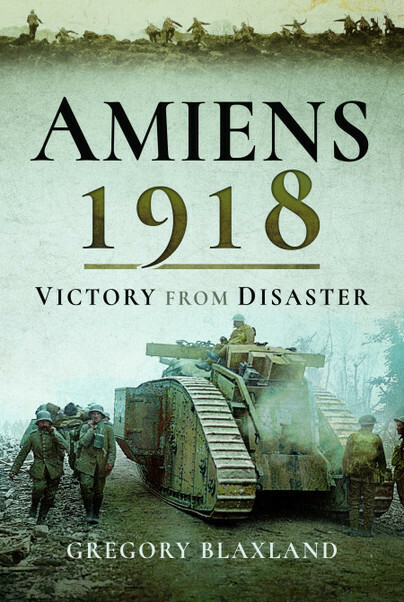 This book is one of the best accounts of the Battle of Amiens in 1918, one of the crucial turning points of the Great War. Blaxland is a great storyteller as well as a historian, so this book has much to recommend it to a wide cross-section of readers. This is detailed, and timely re-print, is an account of the final year of the Great War, provides a valuable, on stop overview, of the final months of the war.